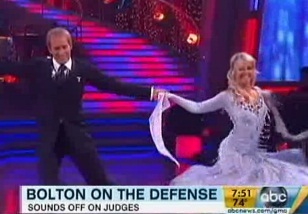 Judge Bruno Tonioli said he hated Michael Bolton’s dance and thought it was “probably the worst” in the Dancing’s 11 seasons. “Dancing with the Stars” The Hoff is off! A bit of a surprise on Dancing With The Stars as David Hasselhoff gets the first boot of the season. “Dancing with the Stars” contestants chat about their results on the opening night of the show. David Hasselhoff, coming in last, says he’s not afraid to get kicked out, Bristol Palin references her famous mother and ‘Dirty Dancing”s Jennifer Grey score. “So You Think You Can Dance” judge and choreographer Adam Shankman is a busy bee these days. In addition to his judging duties on the FOX’s reality hit, Adam has been nominated for an Emmy for producing the Oscars this year and he’s the producer on the new film “Step Up 3D”. Victor Da Silva and Hanna Karttunen perform an amazing exhibition showdance on the BBC’s Strictly Come Dancing. “Dancing with the Stars” Julianne Hough is a triple threat. Julianne Hough, is a triple threat singer, dancer and actress. She is best known as one of the instructors from “Dancing with the Stars,” but has since moved on to focus more on singing. Julianne is currently on tour with Sugarland. Three couples going to the finals on “Dancing with the Stars” next week including ESPN newscaster Erin Andrews and Maksim Chmerkovskiy. The dancing duo drop by “Good Day LA” this morning to talk about what their planning to wow the judges for the finale.